Residents displaced by fire from the Arthur Capper Senior Apartments in D.C. lunched on Thursday with members of the community who helped with evacuations, first responders and city agency staff helping with the problems that the fire has caused. WASHINGTON — Residents displaced by fire from the Arthur Capper Senior Apartments in D.C. lunched on Thursday with members of the community who helped with evacuations, first responders and city agency staff helping with the problems that the fire has caused. 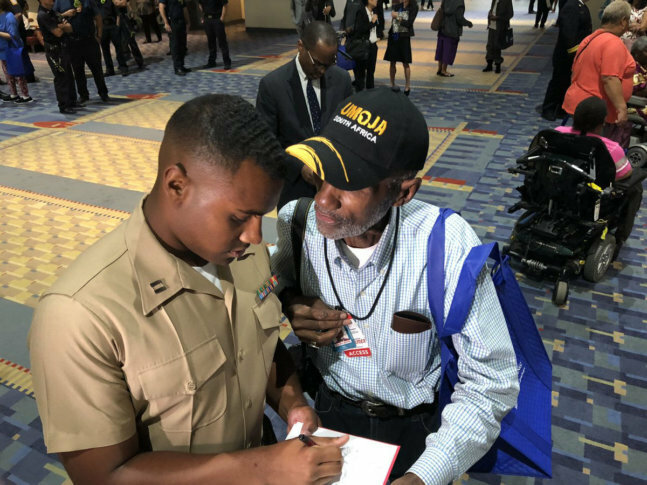 Mayor Muriel Bowser welcomed those gathered for the baked chicken lunch at the Washington Convention Center, beginning with a sympathetic apology. “Let me say how sorry I am that you have experienced this loss,” Bowser said. “I’m sorry that those material things, that go along with all those decades (building memories), you may not have access to. But I’m so grateful that we have access to you and that is the most important thing,” she said to hoots and thunderous applause. Bowser told the residents that case managers working with each of them would contact them soon to offer more permanent housing options. Many of the 160 displaced residents are being housed in hotels, courtesy of the city. As for questions about how the fire started, and why alarm bells didn’t sound, Fire Chief Gregory Dean said at a pre-luncheon meeting with reporters that equipment from the building that might offer clues still is being evaluated. It’s still unclear whether the fire-damaged building can be salvaged.